It's your event and you want it to be toasted, celebrated and made better with wine. If it’s not a good time why bother? We want you to have fun, and like what you taste without the pretentiousness that too often gets uncorked every time a bottle gets opened. Consider this an open-ended invitation to have your event with ENO. We’ll make it a vintage occasion. Semi-private seated or reception style tasting with wine, cheese and chocolate. Best for groups in the 8-50 person range. The best (and most fun) way to learn about wine is to taste. Guests will enjoy sampling portions or “ fights” of wine, cheese and chocolate. For groups that would like to use our entire space, we alter our presentation to more of a “walk around” tasting experience to ensure your guests have room to mingle. Wine tasting semi and fully-private events for 10 - 100 guests. Guests will enjoy hand selected boutique wines, artisan cheeses, charcuterie & chocolates amongst singular views of Michigan Avenue. Full list of passed and shared appetizers available. On premise AV service. 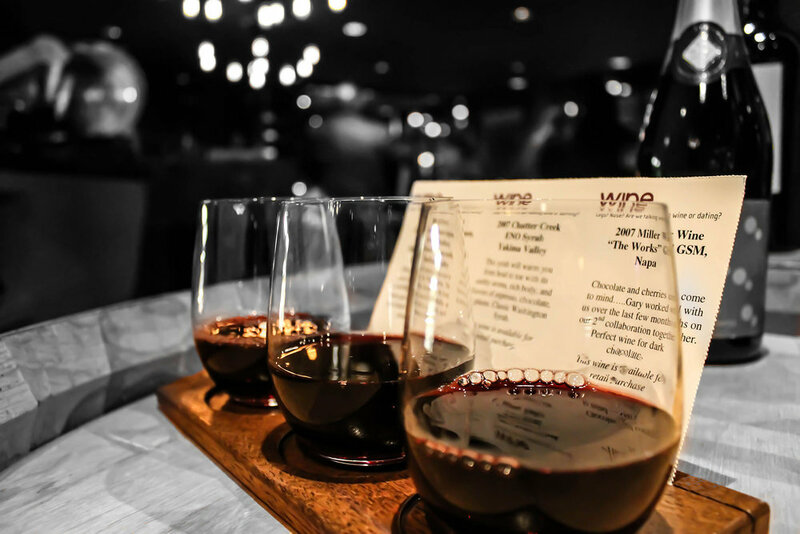 Being an intimate wine bar located in the heart of Union Square in San Francisco, our focus is on small production wines from around the world. We can accommodate groups of all sizes, from 15 to 150. As every event is unique, we are happy to work with you to ensure you are getting everything you want out of your reservation. All events are quoted on a per-head basis, and include unlimited food and wine for a 2-hour time period. Packages can be negotiated if you would like to increase time allocations or upgrade wine and/or food offerings.